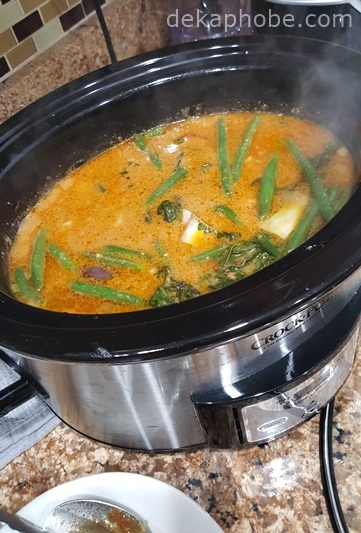 Having a slow cooker is a game changer for me. I was never keen on using the pressure cooker for safety purposes (among other things), but I didn't have to worry about these things with my slow cooker. 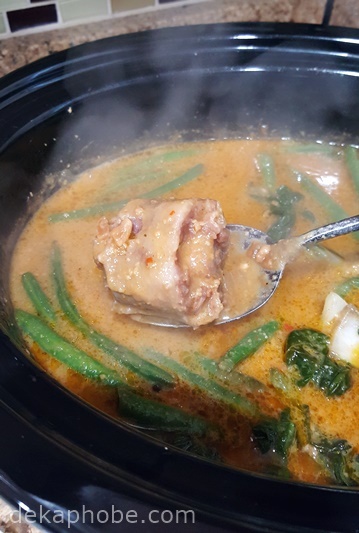 I use the slow cooker for beef stew, nilagang baka and even chicken adobo (so I wouldn't have to shred the chicken to flakes. LOL). I have recently made my all-time favorite Filipino dish: Kare-Kare. Note that I did not use any recipe mixes for this so all the ingredients are estimated. 1. Put oxtail in the slow cooker with onions and beef broth. Slow cook in low for 4 hours or more. 2. Add peanut butter, crushed peanuts and diluted annatto powder in the slow cooker. depends on the thickness you want for the dish. 4. On a separate pan, fry the eggplant, green beans, and bok choy. 5. Add salt and pepper to taste in the slow cooker, then add the vegetables before serving. For a slightly healthier version, you can steam the veggies instead of frying it. You may also use flour instead of cornstarch to thicken the kare-kare, but of course, ground rice is still the best option.